ABC Florida First Coast Chapter was chartered in 1993 and consists of more than 140 member companies representing thousands of Northeast Florida construction industry professionals. The Florida First Coast Chapter serves Contractors, Subcontractors, Suppliers, and Associates in Baker, Bradford, Clay, Columbia, Duval, Flagler, Hamilton, Nassau, Putnam, St. Johns and Union counties. The mission of the Bay Building Industries Association, a professional trade organization composed of licensed contractors, subcontractors and related businesses and affiliated with the Florida Home Builders Association (FHBA) and the National Association of Home Builders (NAHB), is to serve its members by striving for a successful building environment throughout the county. GACAR, the Voice of Real Estate in Alachua County, is dedicated to elevating the excellence, promoting the advancement and ensuring the public trust of the real estate profession while providing our members with the resources, technology, educational opportunities and leadership necessary to conduct an ethical, professional and profitable business. NEFBA serves the construction and associated industries in Baker, Clay, Duval, Nassau and St. Johns counties, supporting members with effective representation on issues related to the industry, educational resources, access to local, state and national experts and a myriad of other services. The purpose of the Tallahassee Board of REALTORS® is to preserve and extend the right to own, use and transfer real property and to serve its members by providing and promoting programs and services which will enhance members' skills and ability to operate their business profitably and ethically. TBA is a professional organization of more than 280 builders, developers, remodeling contractors, specialty trade contractors, and associate members. In order to assist the consumer in new home purchase or home improvement decisions, the TBA provides information about builders, remodelers, developers, and affiliated companies that have agreed to abide by the TBA Code of Ethics, to use accepted professional and business practices, and to meet or exceed local, state and federal standards and regulations. 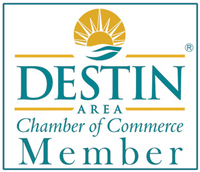 The Destin Area Chamber of Commerce prides itself on working to build successful businesses and a vibrant economy. The Chamber provides products and services to its member businesses helping them grow and prosper. The Chamber acts as the voice of business in government affairs. Governed by a volunteer board of directors and operated by a professional staff, the Chamber works daily to ensure that businesses have what they need to flourish. A strong base of volunteers assists in making sure that all of our programs are relevant to the needs of businesses. The JAX Chamber is a not-for-profit organization with more than 3,000 members serving Northeast Florida, helping members to make connections, grow their businesses and prosper in our community. Members make local, national and international connections at hundreds of events designed to build business relationships and keep you informed. Through educational programs and services, the Chamber works to grow new and existing businesses. The JAX Chamber promotes economic development by attracting and retaining companies, creating jobs and fostering a skilled workforce. Through advocacy programs, the Chamber works for business and represents your interests at the local, state and federal level. The Buy Chamber initiative promotes local member-to-member purchasing. The Tallahassee Chamber’s mission is to enhance the business climate of Florida’s Capital city, while ensuring economic prosperity and improving the quality of life enjoyed by its citizens. This is a dedicated online directory of local businesses that invite everyone age 50 and older to enjoy their special discounts and offers. We don't protect the environment on our own, we work with businesses, non-profit organizations, and state and local governments through dozens of partnerships. A few examples include conserving water and energy, minimizing greenhouse gases, re-using solid waste, and getting a handle on pesticide risks. In return, we share information and publicly recognize our partners. Vistage Florida is an affiliate of Vistage International - the world's leading Chief Executive Organization. Headquartered in Jacksonville, Florida, Vistage Florida has approximately 800 members in upwards to 70 groups across the state, including CEO Groups and Key Leader Groups.